Sometimes I find a grain of truth hiding in the most ridiculous places. I don't mean unexpected, I mean truly ridiculous. Like when I'm talking about my husband's personality vs. my personality, I always quote Stanley Hudson from The Office. "Everything you do, I would do it a different way." We are introvert/extrovert, details/dreams, overly-structured/what is structure? No matter that 0ur end goals are shared, when it comes to methodology, yes. 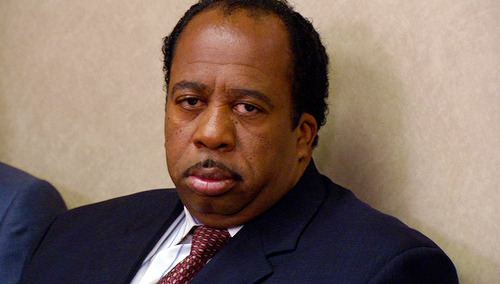 Exactly, Stanley. Ben Affleck: "How you doin', Oscar?" Owen Wilson: “Great. I got that 'excited/scared' feeling. Like 98% excited, 2% scared. Or maybe it’s more – it could be 2 – it could be 98% scared, 2% excited but that’s what makes it so intense." This is the perfect commentary on dreaming big dreams. It is the exact emotion that surges to the top when we take risks: when we stick our necks out for a project, try new things, and undertake tasks that we know are impossible in our own strength. This is how I feel most days, like an oil driller strapped into a rocket. Excited, scared, out of my league, but along for the ride. In what unusual places have you found grains of truth that you keep coming back to?